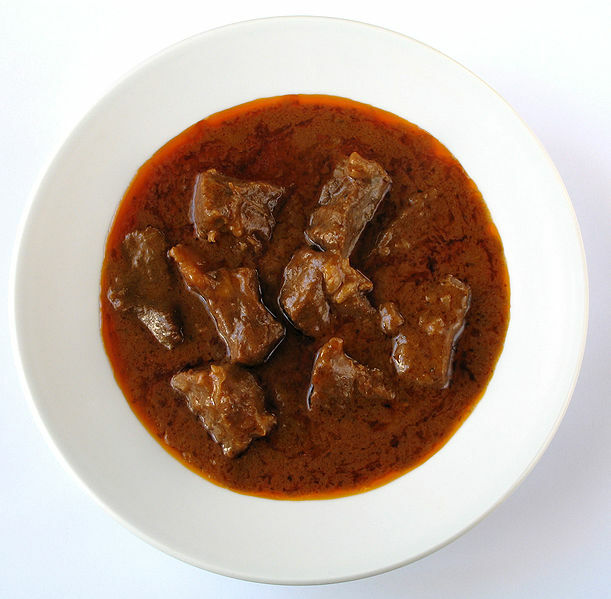 Pörkölt is a meat stew which originates from Hungary, but is eaten throughout Central Europe and the Balkans. In Hungary pörkölt is made with boneless meat, paprika, some vegetables and no potato. It should not be confused with Goulash, a stew with more gravy or a soup (using meat with bones, paprika, caraway, vegetables and potato or different tiny dumplings or pasta simmered along with the meat), or Paprikás (using only meat, paprika and thick heavy sour cream). The traditional Hungarian stews: Goulash, Pörkölt and Paprikas are considered to be the national dishes of Hungary. There are different pörkölt variations from region to region. In most parts of Hungary pörkölt is made with beef or pork. The word Pörkölt simply means "roasted". Pörkölt is made of meat, onion, and sweet paprika powder. Bell peppers, tomatoes or tomato paste, green pepper and garlic are common additions to the basic recipe. Any kinds of meat can be used when making pörkölt. Most common are beef, lamb, chicken and pork, but game, tripe and liver can also be used. A popular meal in traditional Hungarian cuisine is a pörkölt made of tripe, called pacalpörkölt. ("Pacal" is the Hungarian word for tripe). It has a unique and very distinguishable taste from other kinds of pörkölt, often being quite spicy. Much of the quality of a pot of pörkölt is found in the use of the very few ingredients. The spiciness and the taste of the paprika powder used is very important to the taste. A simple Hungarian trick for making good pörkölt is first frying the onions in lard or oil, before making anything else. Then set aside the pot and immediately add paprika powder and the meat and "stir-fry" - (this is the origin of the verb "pörkölni" - to roast). This way the juices are kept inside. Water is added, the same volume as the meat. Pörkölt should be simmered slowly in very little liquid. Flour should never be used to thicken a Hungarian pörkölt. In Hungary pörkölt is served with pasta (tészta), tarhonya (big Hungarian pasta grains) or galuska/nokedli as a side dish. Boiled potato is also a common garnish, and pickles go with the dish nicely counterbalancing the heavy stew with a touch of sour.